Chambord Chateau is the largest and most dramatic of the numerous chateaus in France's Loire Valley. It has 440 rooms and hundreds of fireplaces and chimneys (some are visible in the photo). The building costs nearly bankrupted King Francis I. 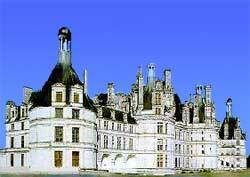 Despite its size and many construction elements, the French Renaissance style Chateau Chambord retains architectural harmony. The main interior attraction is the twin, spiraling staircases, which are intertwined, double-helix style. People ascending do not encounter those descending. He wanted to impress his subjects and visiting foreign dignitaries - and was quite successful in doing it. Gradually, the French restored site. Today it is in fine condition for a nearly 500-year-old building.